The growth of the digital media has brought considerable change to the media landscape. Television has managed to more than hold its own over the last ten years but the newspaper and publishing sector has seen dramatic declines as consumers switch to free online alternatives. Unfortunately for the print industry, PWC’s forecasts point to this trend continuing. Out-of-home advertising is another of the more traditional media formats that has managed to go against the trend of declining revenues. The UK out-of-home media sector has managed to continued the growth trend that followed the London Olympics. Changes in technology have strengthened out-of-home advertising’s position, putting it in a comparatively strong position vis-a-vis other media channels. I’ll look at some of the key developments in the sector. The first development is the industry is taking a much more methodical approach to reporting on consumer’s exposure to outdoor media. In the past the outdoor sector’s reporting was a lot less robust than the equivalent for television and digital but initiatives such as Route in the UK and TAB Out of Home Ratings in the US are going a long way to address this. Route uses mobile technology to track a 28,000 person UK sample and understand the likelihood as to whether audiences will have seen the outdoor assets (and not simply having been in proximity to it). The system also enables the profiling of the poster by audience type (demographics, behaviours and media consumption) rather than raw numbers, enabling more targeted approaches and facilitating cross media campaigns. This reduces wastage in outdoor media campaigns and has put it in a more equal footing with other media channels where they have traditionally had a richer pool of consumer data to pull on. The second development I would point to in out-of-home media sector is the growth in digital outdoor advertising. Digital outdoor advertising when coupled with appropriate content management systems has given media owners the opportunity to serve different creative based on the time of day as well as enabling a more rapid turnaround in creative. The Sun’s Second Sight campaign provides an example of these forces at work, promoting the day’s headlines to commuters during the morning rush hour. Digital formats also provide the opportunity to enrich creative executions. British Airway’s #lookup in Piccadilly Circus used a video advertising billboard to show pictures of a young child tracking a British Airways plane flying overhead with live flight information. The third development I would point to is the growing array of response channels now provided to out-of-home advertisers. Outdoor advertising has traditionally been associated with broadcast advertising, using bold imagery and sharp copy to catch consumers eye. Abbot Mead Vickers’ pioneering work on The Economist and TBWA/Chiat/Day’s work on Apple’s iPod Silhouettes campaign provides an interesting case study of how messages can resonate long after the creative was experienced. The growing prevalence of mobile phones and more specifically smartphone has changed the landscape for outdoor advertisers, giving the media space to have a life beyond the four corners of a billboard. The use of SMS short codes, QR codes and NFC has provided advertisers with a means of engaging with consumers, provided the appropriate incentives (music downloads, games. discounts etc) are given. Universal Pictures tried this with its outdoor campaign for Despicable Me 2 which saw users able to control elements of a digital billboard after synchronising their smartphone with users then able to share the results with their social networks. Advertisers also have the opportunity to enrich their outdoor campaigns using augmented reality mobile apps such as Aurasma, Layar, Blippar and Vuforia. These enable the creation of a virtual layer on top of the outdoor creative, providing the opportunity to inform and entertain. Whilst the results can proving exciting for consumers, the need to download a mobile app in the majority of cases often leaves these campaigns better suited to print or packaging based campaigns where the consumer has more time interacting with the creative. SMS short codes, QR codes and NFC have all been held up as providing a more universal means of forging a channel with consumers but stumbling blocks remain with user experience, awareness and device compatibility issues. The emergence of BLE enabled smartphones and beacon based technology raises the prospect of an improved channel for communicating with consumers, but it remains a largely unproven channel at this stage. Digital outdoor revenues are experiencing strong growth but its important to remember that this is off a small base and traditional analog advertising still makes up the majority of outdoor revenues. Analog outdoor poster campaigns still have a lot to offer advertisers and don’t need to worry about technology getting in the way of an impactful message. Online advertising stalwart Google’s campaign promoting voice search for mobile is one of my outdoor favourites, showing what can be done when smart copy and media placement are paired together. One of the interesting issues that the outdoor sector needs to address is the competition for consumer’s attention when out-of-the-home. Consumers are spending growing amounts of time with their mobile phones – something that’s particularly apparent in the UK. Whilst the growing penetration of smartphones provides a valuable means of bringing campaigns to life, it also provides a competitor for consumers attention when on the go. Whilst this is arguably not the case for drivers, anyone who has walked down a major high street over the last year will have experienced the perils of zombie texters. For outdoor to be a success, the industry will need to ensure that outdoor advertising continues to entertain and inform rather than simply confronting and disrupts as people go about their daily lives. The featured image is Sixe Paredes’s mural for Asphalte in Charleroi, Belgium and covered in StreetArtNews. We have seen web services (eg Office 365, Google Docs, Slingbox) become increasingly device agnostic, allowing users to readily switch from phone to tablet to PC with experiences optimising for each device. With the emergence of the Internet of Things, we are also beginning to see smartphones and tablets increasingly become the hub for a broad range of devices (eg smart homes, digital televisions, self tracking tools). The marketing sector has increasingly moved to deliver marketing experiences that adapt to the different screen real estate as well as enabling a range of digital response channels (Twitter, Facebook, microsite etc) for more traditional media. Millward Brown in the report Digital & Media Predictions 2014 talks about the emergence of multiscreen experiences, point to ‘Shifting’ and ‘Meshing’ with experiences that combine different screens sequentially or simultaneously. It’s in campaigns where we have the meshing of devices with simultaneous content that we’ve seen interesting innovations emerging, with the ability to deliver more immersive experiences rather than simply providing a response channel. Where we’re beginning to see this commonly used is in the integration of PCs with smartphones or tablets. Google has been a pioneer with this approach with its Chrome Experiments programme with examples including Arcade Fire’s Just a Reflektor video and Roll It. These experiences can change smartphones and tablets into touch screen controllers with their in built accelerometers enabling richer range of interactions than those provided by PCs keyboard and mouse. This sought of approach is not going to work in all situations. The process of synchronising PCs with smartphones poses technical challenges and essentially adds an additional obstacle for users before they can experience the content. Producers need to create experiences that minimise the friction in getting two devices working together, not always easy given the wide range of PCs, smartphones and tablets. Consumers on the other hand are being asked to actively interact with the experience, a sometimes difficult ask, particularly for low interest brands. Orange tried it over the New Year period but provided an experience that in my opinion fell flat. Little Dragon tried a less ambitious approach with their music video for Klapp Klapp with phone calls received by the viewer that synchronises with the on screen video. We will no doubt see more of this going forward with predictions that half of all campaigns will be multiscreen in the USA by 2016 according to a survey reported on in MediaPost. The emergence of a growing array of other digital devices (smartwatches, exercise trackers, augmented reality headsets etc) similarly presents further opportunities to deliver more immersive experiences. If you know of any interesting multiscreen campaigns, drop a note in the comments field. The featured image is K N A R F & m a f i a piece from Vienna. I was asked to have a look at some of the trends that I feel are likely to have a considerable impact on the consumer landscape. This is the third in the series, after pieces on mobile enhanced retail and quantified health. There has been a lot of debate in the business press about the opportunity Bitcoin presents to investors. Whilst the future value of Bitcoin is a point of considerable debate, Bitcoin and other cryptocurrencies are likely to have considerable impact on how consumers buy and transfer funds in the future. Traditional online and foreign exchange payment systems take significant fees for the purchase of goods and conversion of currencies, with typically higher fees in the developing world. Using Bitcoin provides the opportunity to avoid these gatekeepers (and some of their protections), lowering the fees encountered by consumers and businesses. For consumers, this has the potential to ease payments abroad, reduce prices and enable the purchase of new goods and services via micropayments. It’s in the growth of micropayments that we are likely to see the most significant change for consumers, as businesses are able to fund services that were previously uneconomic (eg payment for access by article rather than for the whole publication for online media). Kenyan based Kipochi provides a mobile app enabling consumers to send funds internationally. This provides an important innovation for remittance payments given the 10% charge that Western Union and other money transfer agencies typically charge. BitWall gives web publishers the opportunity to charge visitors to their online content via a small one off Bitcoin payment, subscription, via tweeting or watching an advert. Bitwall system integrates with the Coinbase digital wallet system enabling conversion between Bitcoin and US$. Ecommerce website and social network Fancy now provides consumers with the opportunity to pay by Bitcoin. 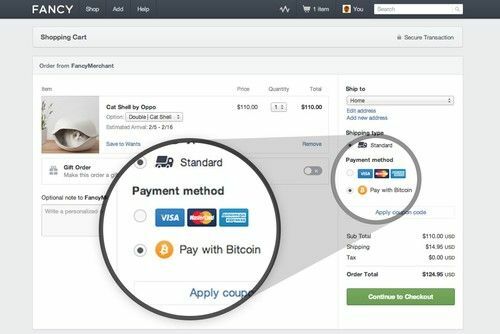 Similarly, ecommerce operators using Shopify are now Bitcoin enabled via integration with BitPay. BitTag: How much is that? One of the problems retailers face in introducing Bitcoin payments is the fluctuating value of the cryptocurrency. This can be more readily managed for ecommerce but provides a bit more of a challenge for bits and mortar retail. BitTag have looked to overcome this by introducing digital price tags which give real-time pricing of goods in Bitcoin. I was asked to have a look at some of the trends that I feel are likely to have a considerable impact on the consumer landscape. This is the second in the series, after an earlier piece on mobile enabled shopping. We have seen strong growth in the use of fitness trackers such as Runkeeper and Strava and of wearable devices such as Nike+ Fuelband, Jawbone Up and Fitbit since the launch of Nike+ in 2006. This field has gained a further boost with reports that Apple is building an application codenamed Healthbook which will see it more actively taking a role in this space. But it’s the adoption of tracking and monitoring devices in the more traditional health field that we are likely to have a more discernible impact on individuals’ lives. Devices are becoming increasingly available that enable consumers to track their own vital signs and share these with medical professionals. This sharing of information will be a key factor in facilitating remote and virtual care, particularly as tools and trackers become designed with a consumer audience in mind. This will enable developed countries to better cope with the growing burden of an ageing population without having to resort to inpatient care. Diabetes is a growing problem, with sufferers expected to increase from 366 million to 552 million globally by 2030. 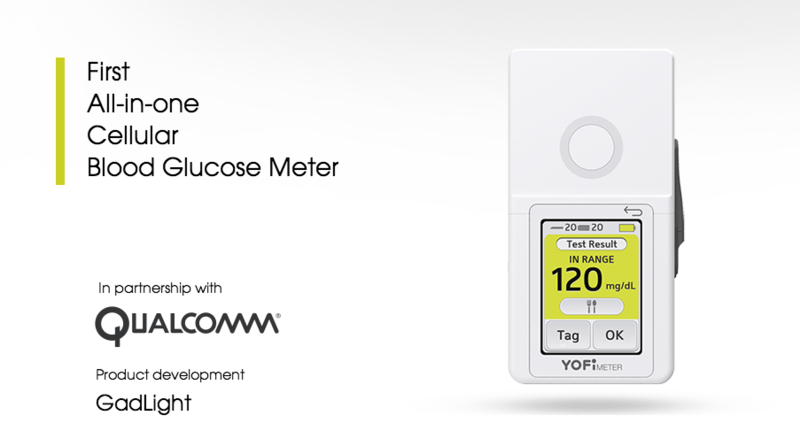 The YoFi Meter looks to help patients better manage their glucose levels with an integrated tester and reader and integrated 3G connection allowing interested family and medical professionals to stay informed. Getting patrients to follow their treatment programme is not always easy, particularly when dealing with older patients who are multi-medicated. 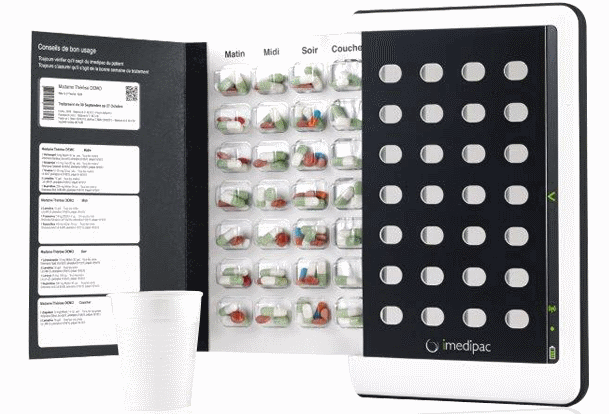 The imedipac looks to make this process easier in what is described as a ‘connect pill box.’ The device provides users with measured doses and treatment reminders, aiding patients with mental, sensory or mobility difficulties and with the ability to share treatment information with relevant health professionals. Concussion is receiving more attention as consumers become more aware of the long term damage associated with it. 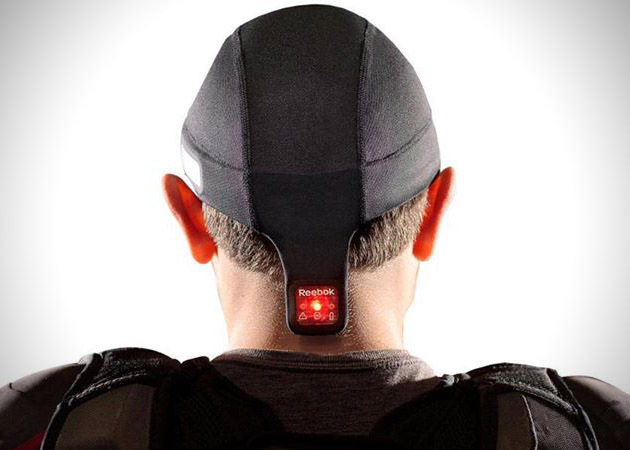 Reebok has developed a skullcap with an embedded sensor that determines the impact a head receives, with warnings when a player has receives a moderate or severe hit and also measures the cumulative number of impacts. This enables players and coaches to make more rational decisions when players should be on and off the field/boxing ring. I was asked to have a look at some of the trends that I feel are likely to have a considerable impact on the consumer landscape. This is the first in the series, drawing on my earlier presentation on mobile retail. But smartphones are also enabling bricks and mortar retailers to provide a more enriched instore experience for consumers. We saw the beginnings of this with the introduction of QR codes, enabling consumers to access product information, reviews and comparisons from their handset and expanding the selection of products beyond what is physically available instore. The introduction of Bluetooth Low Energy (BLE) beacons has made the process of bringing information to the attention of consumers a whole lot easier, with information and alerts triggered by consumers’ location within the store after downloading the relevant app. Smartphones are also offering to enrich loyalty and discounting campaigns, making the process of rewarding more tangible and providing offers to consumers that they can more readily take up. Whilst we’re still to see the arrival of the much-touted mobile wallet, we have seen retailers begin to integrate payments into their own mobile apps, providing an additional means of purchase, which can prove particularly valuable for regular customers. These initiatives provide retailers with a rich seam of data with which to better understand their audience and the opportunity to provide a more personalised response to consumers when combined with an effective data management strategy. Macy’s has partnered with Shopkick in the deployment of shopBeacon (BLE) transmitters. Consumers who have downloaded the Shopkick app will be welcomed by the app when entering participating branches and then shown location-specific deals, discounts, recommendations and rewards, without having to open the app. 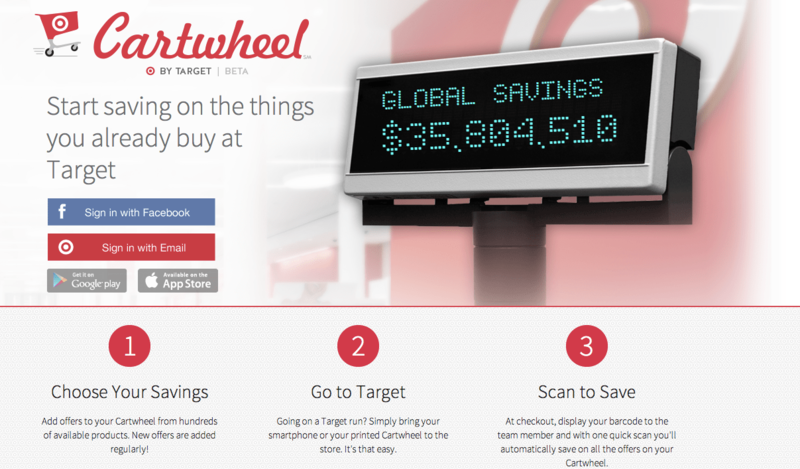 Target offers consumers the ability to browse for discounts online, add the offers to the Cartwheel mobile app (and share with friends via Facebook) and then redeem the offers at the checkout. Target must be doing something right as it came at as the most browsed retailer on mobile in the US. 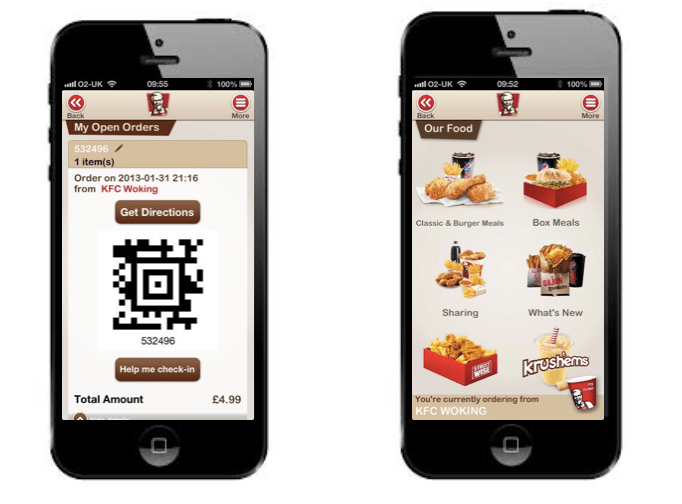 KFC is piloting the Fasttrack app in the UK, enables consumers to place an order and get priority service when they arrive and check in at the participating branch. The app makes it easier to order by remembering favourite items and payment details. For the participating branches, this has meant cutting down waiting and ordering time by 60-70%, sounds like a win-win situation. I gave the following presentation recently on the application of Mobile First within a retail environment. You can find the accompanying text and references in the post below. Slide 2: There’s no escaping the fact that mobile is here as smartphone and tablet penetration increases. Slide 3: Mobile is now taking the lion’s share of growth in ecommerce sales with tablets performing strongly and sales from smartphones growing particularly fast. Slide 4: Whilst sales are on the increase, it’s also important to look at mobile as an important contributor to offline and online sales. Slide 5: I’ve taken a broader view of mobile first, looking at how retailers can better enable their offering to mobile and tablet users. It’s important to note that the retail sector is not homogenous and different strategies are going to work better for different parts of the industry. Slide 6: Mobile and tablet devices are getting more and more capable, but their form factor provide some limitations. Among these are more limited keyboard, smaller screen size and less powerful process. This raises the need for a digital presence that’s built with these constraints in mind. On top of this, further impetus is driven by Google’s search optimisation policy which is penalising websites with slow mobile load times. Slide 7: Despite mobile device’s technical limitations, consumers expect their mobile devices to deliver a similar level of performance to their desktop equivalent. Slide 8: The different formats of mobiles, tablets and PCs provide different optimum use cases. The mobile screen is great for snack sized content. Tablet screen is a more lean back medium which is great for consuming media. PCs on the other hand are often described as lean forward medium where the user is better orientated to interacting with the content. But for mobile devices, it’s not all about limitations as they’re increasingly loaded with a range of sensors which give them capabilities not provided by your PC. There is a real need for digital resources to be designed in a way that reflects these differences. Slide 9: Mobile First asks designers to ensure that their designs will work within these constraints and not simply provide a lesser experience. Slide 10: The emergence of card based user design formats, all of which look to adapt readily to the different devices form factors. Designing for mobile use also means legible typography, content that renders in both portrait and landscape, concise content, avoidance of plugins such as Flash, click to call functionality and the minimising of user text input. Slide 11: It’s also important to remember it’s not simply about the visual appearance but also ensuring that consumers have an easy way to navigate to where they want. This means a user experience designed for navigating by touch and meta data designed to enable the mobile searcher to quickly get from A to B. Slide 12: The constraints of mobile mobile devices also make payments more difficult than on your typical PC. So it’s well worth giving thought to services such as Amazon Payments and Paypal which reduce the obstacles to purchase for mobile users. We’re also beginning to see new models of payments emerge with initiatives such as Starbucks’ Tweet a Coffee and the use of mobile messaging platforms to make payments. Slide 13: It’s also important to consider native apps. These typically enable a great degree of personalisation, can make better use of phones’ native functionality, can be used offline and are typically quicker to start up. Slide 14: Mobile apps also provide a means of getting consumers to engage with your brand outside of just the purchase process. Content that informs and or entertains has the opportunity to put multiple shop windows in front of the consumer. Examples of these include Tesco’s meal planner or for a more light hearted approach, American retailer Home Depot’s mobile game. It’s important to stress given the increasingly crowded nature of the app ecosystem, you cannot adopt a build and they will come approach. Slide 15: Consumers are faced with an endless array of choices, so the content needs to be compelling and the app needs to work well or consumers will simply go elsewhere. Any mobile app developed needs to be promoted as it’s rare for a resource to go viral without a bit of a foot up. Mobile app based strategy is not without its hurdles given that development is platform specific leading to the exclusion of users on other platforms. As an example, Android has the greater penetration in the UK but research points to iOS users making greater use of their devices’ functionality including spending more online. 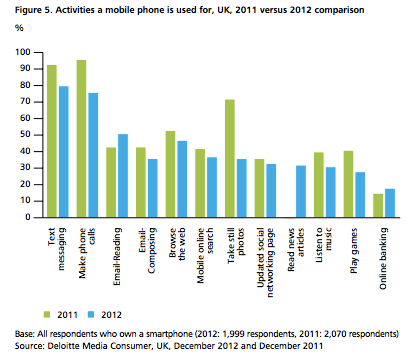 There’s also evidence that points to different audience profiles for the different mobile platforms. Finally, Android has a more fragmented environment with a much wider range of devices and operating systems complicating any app roll out. Slide 17: Whilst the majority of social networks function on PCs, it’s often on mobiles and tablets where they come into their own, particularly when it comes to the sharing of content and it’s on these devices we’re seeing the strongest growth. Slide 18: This raises the need to optimise social channels for mobile users. Whilst many of the principles remain the same as for desktop, there is even greater emphasis on brevity of content and the use of strong imagery to catch the eye of users. Slide 19: Instagram, Vine and Snapchat are all built on Mobile First principles and provide great opportunities to reach consumers in a way that takes the best advantage of the limited screen space of the mobile phone with paid and earned media campaigns. Slide 20: Pinterest has been a powerful generator of retail traffic with the platform offering a strong mobile presence. Driving traffic to Pinterest provides a great means of increasing consumer engagement with retailer’s brand and potentially to purchase. It’s also important to consider other opportunities in the social space with Polyvore in particular standing out with its ability to generate sales traffic. Slide 22: Despite the growing penetration of mobile and tablets, the media world has still to adjust their spend to reflect this change. At a basic level, adding the use of mobile media in conjunction with traditional advertising brings an incremental lift in marketing campaigns. Slide 23: But where the concept of cross media activity really comes into its own is where different media are used together, increasing consumers’ engagement with the message. Slide 24: A good example of this is the use of augmented reality apps, bringing traditional static media to life and providing a response channel for consumers. Slide 25: We are also seeing the integration of mobile functionality into television advertising that goes well beyond simply providing a URL or hashtag. Twitter now provides the opportunity to target advertising at Twitter users who have identified themselves as watching a particular programme, Kia is asking users to play tennis against their television and mobile app Shazam is being used as a response channel for viewers. We’re likely to see a whole lot more of these initiatives going forward. Slide 26: Where it gets really exciting is when different digital screens are combined creating an altogether richer interactive experience. Google has been doing this with its Chrome Experiments, and Orange had a go at it with it’s Hello 2014 campaign that ran over New Year’s Eve. This multiscreening approach offers real potential but doesn’t come without its own problems. The varied nature of mobile devices brings technical challenges, although the rise of HTML5, WebGL and other technologies are proving important enablers. More generally, different media platforms have been developed on different principles and cross media platforms are requiring the development of common frameworks. Slide 27: One of the key differentiators of mobile is its portability, raising place as an important variable. Location based services provide retailers with the opportunity to help get consumers into physical stores and keep them returning. To put this in perspective 57% of smartphone users look for information at least once a week and 25% of smartphone users look for information daily. Slide 28: Retailers need to ensure their physical stores are findable, with locations in online map services, retailers own mobile properties and location based services such as Fourquare and Facebook Mobile. Slide 29: Building on the earlier location based services is the finding of products, services and information instore using third party resources such as Google maps or via owned media. Slide 30: It’s also worth encouraging customers to check in via Foursquare and Facebook, providing the retailer with free publicity across the consumer’s social networks. Location based marketing is seen by many as a godsend, offering the opportunity to reach consumers when it takes them the least effort to purchase. The problem is that close proximity alone is not necessarily a good indicator of whether the consumer would make a good prospect. The best results come when location is paired with other variables to give a robust means of targeting consumers. We also need to be acutely aware of overloading consumers with marketing messages which could lead to their abandonment of this channel. Slide 32: Mobile is coming to play a significant role in the instore retail environment. Slide 33: Mobile apps like Amazon’s Price Check have raised the spectre of showrooming, as ecommerce operators aim to turn bricks and mortar shops into the display stands for their own operations. And there is plenty of evidence to support consumers using their mobiles to check prices. Slide 34: But international research by the Columbia Business School points to consumers engaging in a broad range of activities instore and it’s not simply a case of try there and buy elsewhere. Slide 35: The use of instore maps provides a means of getting consumers to your goods and services, but where smartphones really come into their own is enriching the retail environment. This has traditionally required the sometimes clumsy process of scanning QR codes but NFC and Bluetooth Low Engery Beacons are providing a more seamless experience for mobile users. This provides smartphone users with the opportunity to find out further information about the store and its products and services. Like an Amazon user, an instore shopper has the potential to pull down consumer and expert reviews, product demonstration videos and comparisons whilst keeping within the retailers’s digital and physical environment. Slide 36: We are also seeing smartphones used to deliver offers, promotions and rewards. A lot of noise is currently being made about the introduction of beacon based programmes enabling users to receive location specific deals, discounts and recommendations. Slide 37: Mobile payments is another area we are seeing a significant change, offering consumers an easier way to purchase instore whilst avoiding unnecessary queues. There are a range of solutions currently on offer, with mobile payment providers such as Google Wallet, Paypal, Masterpass and Square but it’s in the area of retailer specific solutions that we’re seeing the greatest success. When considering mobile payments and beacon based initiatives, it’s also important to think about how any instore promotions will be integrated with retailer’s loyalty programmes and discounting campaigns which are also increasingly mobile enabled. Like the use of instore beacons, mobile payments is very much a nascent field in which we’re seeing a rapid evolution of best practice. Slide 39: The above quote comes from the New York Times paints a rather unwelcoming picture for the bricks and mortar retailer, but it’s not all bad. Mobile has the real potential to strengthen the hands of retailers with a physical presence. A more positive note was recently sung by IBM who have touted buying local as one of the key forecasted trends over the next five years driven by the opportunities of a more digital enriched shopping experience. Ad blockers: Consumers friends or foe? The media sector is going through a period of transition as it moves increasingly from print to online. A potential complication in this move is the increasing growth of adblocking software by consumers. Adblocking software typically acts as an extension on browsers, allowing users to block a range of advertising formats including banners, pop-ups and video ads including content on Facebook and YouTube. Adblock Plus is the most well known of the extension providers and has argued that it aims to promote advertising that is more user friendly — although their position is somewhat undermined by their unblocking of advertising from some sites for a share of their revenues. For internet users faced with an increasingly disruptive array of online advertising formats (driven by falling response rates), this provides a welcome relief and is reflected in the growth of these services. A recent report from PageFair estimated 22.7% of internet users are employing adblocking software with an annual growth rate of 43% per year. Media outlets do have the option of blocking viewers using adblocking services but many appear reluctant so far as seen by Ars Technica’s approach. As the use of adblockers becomes the norm rather than simply an edge case, this is likely to be revisited. Reductions in online advertising revenues are also likely to bring forward the introduction of paywalls and the move towards native advertising where the line between content and advertising is blurred. Neither solution present particularly attractive solutions for consumers looking for a free ride. As for me, I am going to continue to use Adblock Plus, but I am adding those sites I care about to the list of manually whitelisted domains. 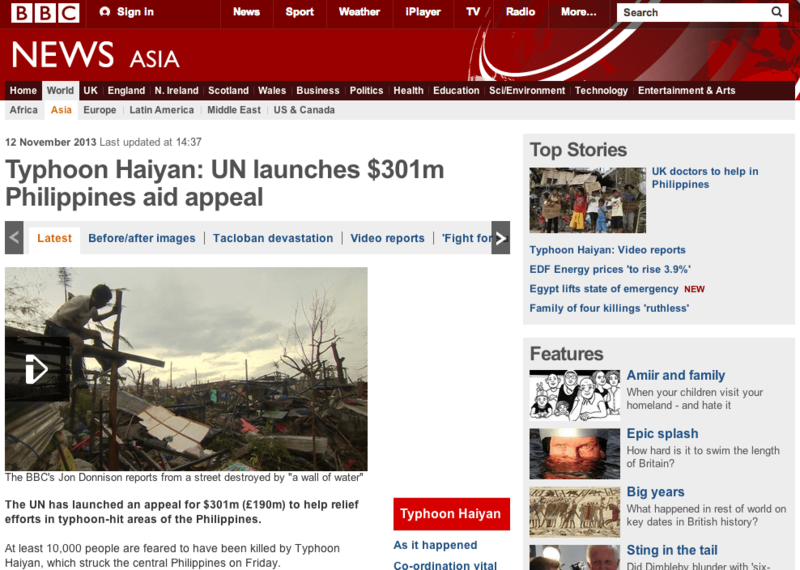 This way I can hopefully see this sites continue to offer advertising sponsored content well into the future. Posted on November 22, 2013 December 1, 2015 Categories Digital Tools, Thought Starters, Trends to WatchTags ad blocker, Adblock Plus, native advertising, online advertising, online media, PageFairLeave a comment on Ad blockers: Consumers friends or foe?